As much as we may try to stay on top of things, some incidents are just out of our control. Be it harsh weather or a new driver to the household, it's not uncommon to find that your door is just not what it used to be. Don't be embarrassed when your neighbors come by, instead, let us get to work replacing it with a brand new one worthy of your home. Make Your House Vibrant Again! Your garage door makes up a huge portion of the front of your house and is often one of the first things that visitors see. Make it something worth looking at, and upgrade your door to one of the various new styles that will get your home looking lovely again. Even if your current door is perfectly fine, just like putting on a coat of paint on the outside of your home, an update to your garage door can make all the difference. It will reinvigorate the look of your household. Our technicians can install any variety from the standard to carriage style, and more. Tired of Fighting with the Remote? If the opener of your garage door takes a few tries before it'll finally open or close it, it's likely time to get a new one. 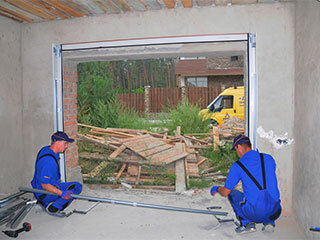 We also offer installation of new openers to save you the annoyance of having struggle with the control, or have to manually open it yourself if it refuses to work. Don't strain yourself having to try to lift something so heavy, instead allow us to quickly and easily put in a new one that works with one simple press. Whatever model you're interested in, we're likely to have it ready to go. Also, if you tend to drop things and are worried about breaking yet another remote, we've got you covered! We offer heavy-duty models that can withstand those falls, no problem. Get Your Home Looking Pristine Again with a New Garage Door Installation! Impress the neighborhood! Treat yourself and your home to a brand new and beautiful garage door. You'll be shocked at how just that one thing will perk up the look of the whole front of your house, and make it go from dab to striking. Call Garage Door Repair Williamsburg today to make an appointment!